The evolution of biological complexity is one important outcome of the process of evolution. Evolution has produced some remarkably complex organisms - although the actual level of complexity is very hard to define or measure accurately in biology, with properties such as gene content, the number of cell types or morphology all being used to assess an organism's complexity. Some used to believe that evolution was progressive and had a direction that led towards so-called "higher organisms," despite a lack of evidence for this viewpoint. This idea of "progression" and "higher organisms" in evolution is now regarded as misleading, with natural selection having no intrinsic direction and organisms selected for either increased or decreased complexity in response to local environmental conditions. Although there has been an increase in the maximum level of complexity over the history of life, there has always been a large majority of small and simple organisms and the most common level of complexity (the mode) appears to have remained relatively constant. Nonetheless, the Last Universal Common Ancestor (LUCA) is the most recent common ancestor of all current life on Earth. LUCA should not be assumed to be the first living organism on Earth. The LUCA is estimated to have lived some 3.5 to 3.8 billion years ago (sometime in the Paleoarchean era). The composition of the LUCA is not directly accessible as a fossil, but can be studied by comparing the genomes of its descendents, organisms living today. By this means, a 2016 study identified a set of 355 genes inferred to have been present in the LUCA. Organisms that reproduce more quickly and plentifully than their competitors have an evolutionary advantage. Consequently, organisms can evolve to become simpler and thus multiply faster and produce more offspring, as they require fewer resources to reproduce. A good example are parasites such as Plasmodium - the parasite responsible for malaria - and mycoplasma; these organisms often dispense with traits that are made unnecessary through parasitism on a host. A lineage can also dispense with complexity when a particular complex trait merely provides no selective advantage in a particular environment. Loss of this trait need not necessarily confer a selective advantage, but may be lost due to the accumulation of mutations if its loss does not confer an immediate selective disadvantage. For example, a parasitic organism may dispense with the synthetic pathway of a metabolite where it can readily scavenge that metabolite from its host. Discarding this synthesis may not necessarily allow the parasite to conserve significant energy or resources and grow faster, but the loss may be fixed in the population through mutation accumulation if no disadvantage is incurred by loss of that pathway. Mutations causing loss of a complex trait occur more often than mutations causing gain of a complex trait. With selection, evolution can also produce more complex organisms. Complexity often arises in the co-evolution of hosts and pathogens, with each side developing ever more sophisticated adaptations, such as the immune system and the many techniques pathogens have developed to evade it. For example, the parasite Trypanosoma brucei, which causes sleeping sickness, has evolved so many copies of its major surface antigen that about 10% of its genome is devoted to different versions of this one gene. This tremendous complexity allows the parasite to constantly change its surface and thus evade the immune system through antigenic variation. More generally, the growth of complexity may be driven by the co-evolution between an organism and the ecosystem of predators, prey and parasites to which it tries to stay adapted: as any of these become more complex in order to cope better with the diversity of threats offered by the ecosystem formed by the others, the others too will have to adapt by becoming more complex, thus triggering an ongoing evolutionary arms race towards more complexity. This trend may be reinforced by the fact that ecosystems themselves tend to become more complex over time, as species diversity increases, together with the linkages or dependencies between species. Passive versus active trends in complexity. Organisms at the beginning are red. Numbers are shown by height with time moving up in a series. If evolution possessed an active trend toward complexity, then we would expect to see an increase over time in the most common value (the mode) of complexity among organisms, as shown to the left. Indeed, some computer models have suggested that the generation of complex organisms is an inescapable feature of evolution. This is sometimes referred to as evolutionary self-organization. Self-organization is the spontaneous internal organization of a system. This process is accompanied by an increase in systemic complexity, resulting in an emergent property that is distinctly different from any of the constituent parts. However, the idea of increasing production of complexity in evolution can also be explained through a passive process. 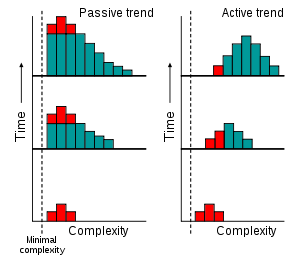 As shown on the left, this involves an increase in variance but the mode does not change. The trend towards higher complexity over time exists, but also involves increasingly smaller portions of biological life. In this hypothesis, any appearance of evolution acting with an intrinsic direction towards increasingly complex organisms is a result of people concentrating on the small number of large, complex organisms that inhabit the right-hand tail of the complexity distribution and ignoring simpler and much more common organisms. This passive model predicts that the majority of species are microscopic prokaryotes, which is supported by estimates of 106 to 109 extant prokaryotes compared to diversity estimates of 106 to 3·106 for eukaryotes. Consequently, in this view, microscopic life dominates Earth, and large organisms only appear more diverse due to sampling bias. In the 19th century, some scientists such as Jean-Baptiste Lamarck (1744–1829) and Ray Lankester (1847–1929) believed that nature had an innate striving to become more complex with evolution. This belief may reflect then-current ideas of Hegel (1770–1831) and of Herbert Spencer (1820–1903) which envisaged the universe gradually evolving to a higher, more perfect state. This view regarded the evolution of parasites from independent organisms to a parasitic species as "devolution" or "degeneration", and contrary to nature. Social theorists and propagandists have sometimes interpreted this approach metaphorically to decry certain categories of people as "degenerate parasites". Later scientists regard biological "devolution" as nonsense; rather, lineages will become simpler or more complicated according to whatever forms have a selective advantage. ↑ Adami C (2002). "What is complexity?". BioEssays. 24 (12): 1085–94. doi:10.1002/bies.10192. PMID 12447974. ↑ Waldrop M.; et al. (2008). "Language: Disputed definitions". Nature. 455 (7216): 1023–1028. doi:10.1038/4551023a. PMID 18948925. ↑ McShea D (1991). "Complexity and evolution: What everybody knows". Biology and Philosophy. 6 (3): 303–324. doi:10.1007/BF00132234. ↑ Ayala FJ (2007). "Darwin's greatest discovery: design without designer". Proc. Natl. Acad. Sci. U.S.A. 104 (Suppl 1): 8567–73. Bibcode:2007PNAS..104.8567A. doi:10.1073/pnas.0701072104. PMC 1876431 . PMID 17494753. ↑ Doolittle WF (February 2000). "Uprooting the tree of life". Scientific American. 282 (2): 90–5. doi:10.1038/scientificamerican0200-90. PMID 10710791. ↑ Glansdorff N, Xu Y, Labedan B (2008). "The last universal common ancestor: emergence, constitution and genetic legacy of an elusive forerunner". Biology Direct. 3: 29. doi:10.1186/1745-6150-3-29. PMC 2478661 . PMID 18613974. ↑ Sirand-Pugnet P, Lartigue C, Marenda M, et al. (2007). "Being Pathogenic, Plastic, and Sexual while Living with a Nearly Minimal Bacterial Genome". PLoS Genet. 3 (5): e75. doi:10.1371/journal.pgen.0030075. PMC 1868952 . PMID 17511520. ↑ Maughan H, Masel J, Birky WC, Nicholson WL (2007). "The roles of mutation accumulation and selection in loss of sporulation in experimental populations of Bacillus subtilis". Genetics. 177 (2): 937–948. doi:10.1534/genetics.107.075663. PMC 2034656 . PMID 17720926. 1 2 R. Dawkins; J. R. Krebs (1979). "Arms Races between and within Species". Proceedings of the Royal Society B. 205 (1161): 489–511. Bibcode:1979RSPSB.205..489D. doi:10.1098/rspb.1979.0081. PMID 42057. ↑ Pays E (2005). "Regulation of antigen gene expression in Trypanosoma brucei". Trends Parasitol. 21 (11): 517–20. doi:10.1016/j.pt.2005.08.016. PMID 16126458. ↑ Heylighen, F. (1999a) "The Growth of Structural and Functional Complexity during Evolution", in F. Heylighen, J. Bollen & A. Riegler (eds.) The Evolution of Complexity Kluwer Academic, Dordrecht, 17-44. 1 2 Carroll SB (2001). "Chance and necessity: the evolution of morphological complexity and diversity". Nature. 409 (6823): 1102–9. Bibcode:2001Natur.409.1102C. doi:10.1038/35059227. PMID 11234024. ↑ Furusawa C, Kaneko K (2000). "Origin of complexity in multicellular organisms". Phys. Rev. Lett. 84 (26 Pt 1): 6130–3. arXiv:nlin/0009008 . Bibcode:2000PhRvL..84.6130F. doi:10.1103/PhysRevLett.84.6130. PMID 10991141. ↑ Adami C, Ofria C, Collier TC (2000). "Evolution of biological complexity". Proc. Natl. Acad. Sci. U.S.A. 97 (9): 4463–8. arXiv:physics/0005074 . Bibcode:2000PNAS...97.4463A. doi:10.1073/pnas.97.9.4463. PMC 18257 . PMID 10781045. ↑ Oren A (2004). "Prokaryote diversity and taxonomy: current status and future challenges". Philos. Trans. R. Soc. Lond., B, Biol. Sci. 359 (1444): 623–38. doi:10.1098/rstb.2003.1458. PMC 1693353 . PMID 15253349. ↑ May, R. M.; Beverton, R. J. H. (1990). "How Many Species?". R. M. May, Philos. Trans. R. Soc. London Ser. B. 330 (1257): 293. doi:10.1098/rstb.1990.0200. ↑ Schloss P, Handelsman J (2004). "Status of the microbial census". Microbiol Mol Biol Rev. 68 (4): 686–91. doi:10.1128/MMBR.68.4.686-691.2004. PMC 539005 . PMID 15590780.